Are We Going to Have too Much Apartment Construction in Los Angeles? So far the answer is no; we have not had too much apartment construction. 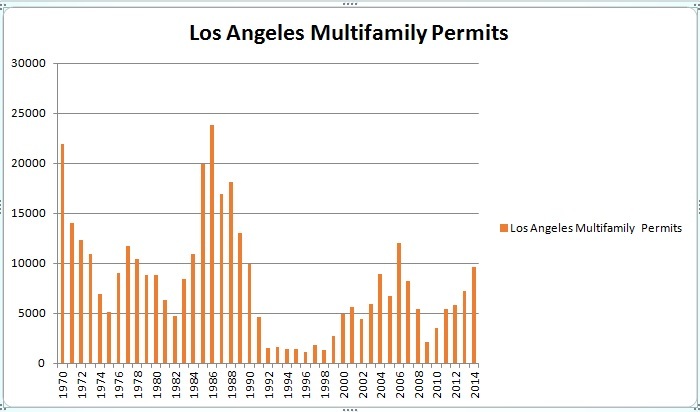 Last year we hit 10,000 multifamily permits in the City of Los Angeles. It will take one to two years for this supply to come online. These units will not constitute a significant amount of historical supply. It has not reached the level of the mid 2000s, and it is nowhere near the levels reached during the mid 1980s. Marcus and Millichap forecasts a 50 basis point increase in the LA County vacancy rate in 2015. They attribute this to the completion of 10,000 units representing a 0.9% increase in the stock. Therefore, Marcus forecasts an absorption of only 4,444 units. In 2014, vacancy declined 40 basis points although 9,300 units came on line. This decline indicates an absorption of 13,700 multifamily units in 2014. So it appears Marcus is forecasting a reduction in absorption in 2015. The supply of new multifamily units is concentrated in Downtown Los Angeles, Hollywood, and Marina/Playa Vista. These areas may experience some temporary rise in vacancy and competition. The new supply can influence the severity of the downturn during a recession. Multifamily rentals experienced a more significant downturn during the 1990 recession due to the large supply overhang of units built from 1984 to 1989. Los Angeles rents fell from their peak in 1990 and did not recover until the end of the decade. During the 1990s, there was little multifamily construction, and, as a result, apartments did not experience much in the way of rent reductions during the 2000 recession. A greater supply was built during the mid 2000s–although many units were probably for sale and not for rent. In any case, rents fell by 10% to 20% during the 2009 recession. We see many cranes and read many announcements of apartment projects. Unlike other times, owners intend to rent most of these multifamily units versus offering them for sale. Even though the recent permit numbers do not indicate a supply above historical norms–many planned projects may turn into reality. The first quarter 2015 permit results would imply a rate of over 13,000 units. Successive years above 15,000 to 20,000 permits may indicate a supply reminiscent of the late 1980s when supply did impact rents negatively. The above statistics can provide a context to current rental housing permitting, and some guide to supply levels which may influence the severity of another downturn.